In the previous article you learnt to implement the ASP.NET Core identity in your web applications. In most of the real world cases you would like to confirm that the email address entered by the user at the time of creating the account genuinely belongs to him. So, verifying the user's email address becomes important. Luckily, ASP.NET Core provides an easy way to do just that. In this article you will modify the application developed earlier to add email verification step. You generate an email verification token - an encrypted value - using ASP.NET Core Identity. The user clicks on the email verification link and if all goes well his email is marked as verified. When the user attempts to log-in to the system you check whether his email is verified or not and accordingly allow or deny the access. Although ASP.NET Core Identity provides most of the functionality needed to implement the above steps, you need an external help. You need a mechanism to send emails through your code. In .NET Framework we used System.Net.Mail classes to do that. There is no direct equivalent in .NET Core. You will need to use some third-party NuGet packages. For the sake of our example I am going to stick with SmtpClient class from .NET Framework's System.Net.Mail namespace. Remember, however, that we do this purely to remain focus on the main topic of this article. You can substitute a third-party email sending component at a later time. As you can see the frameworks section now specifies net452 as the target framework. Then add a reference to System.Net assembly using the familiar Add Reference dialog. Doing so will add the frameworkAssemblies key to the net452 as shown above. Notice the code marked in bold letters (the other code remains unchanged). The code calls the GenerateEmailConfirmationTokenAsync() method of UserManager class by passing the MyIdentityUser object. This call returns an encrypted confirmation token for that specific user. For verifying an email address you need user's Id and his confirmation token. A URL is formed using Url.Action() that points to the ConfirmEmail action of the Account controller. You will write this action shortly. The URL contains the user's Id and the confirmation token in the query string. Then the code creates an SmtpClient object and configures it in such a way that outgoing emails are stored in the Test folder. Remember, again, that we do this just for testing. In a real application you will obviously need a better way like a third-party component. Then the code sends an email using the Send() method of SmtpClient. The from address, to address, subject and the body is specified as shown. For the sake of clarity the actual token is not shown above. But you can see how the query string contains "userid" and "token" values. The ConfirmEmail() action receives the user's ID and confirmation token from the query string. Inside, the code finds the MyIdentityUser whose Id matches with the one sent through the query string. Then ConfirmEmail() method of UserManager is called to confirm the user's email The ConfirmEmail() method requires the MyIdentityUser object and the confirmation token. 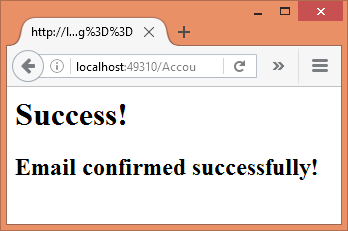 The result of ConfirmEmail() is checked and if all goes well a success view is displayed in the browser. The following figure shows a sample run of the application. Notice the new code marked in bold letters. It finds a MyIdentityUser based on the username value. It then checks whether that user's email address has been confirmed or not. This is done using IsEmailConfirmedAsync() method of the UserManager. If IsEmailConfirmedAsync() returns false (email not yet verified) an error message is displayed to the user, otherwise the login process continues as before.